Happy Thursday. We got lucky again this week, with Hurricane Olivia down to a tropical storm today and besides some heavy rains still to come, not much of an impact on Oahu, Kauai, and while there were damages, it certainly was not as bad as it could have been on Maui. My thoughts are with the East coast and those dealing with Hurricane Florence. I hope for a similar outcome. If you are nervously anticipating a storm, it doesn't hurt to have a good thriller to distract you like Cross Her Heart by Sarah Pinborough. I am happy to be today's stop on the TLC Book Tour for this novel. 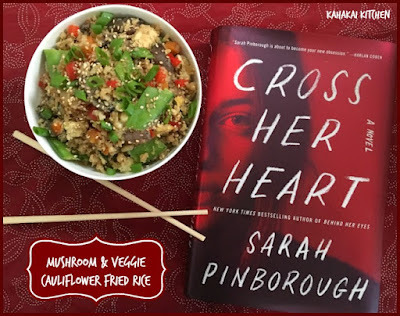 Accompanying my review is a recipe for healthy and tasty bowl of Mushroom & Veggie Cauliflower Fried Rice, inspired by my reading. But when a handsome client shows an interest in her, Lisa starts daydreaming about sharing her life with him, too. Maybe she’s ready now. Maybe she can trust again. Maybe it’s time to let her terrifying secret past go. 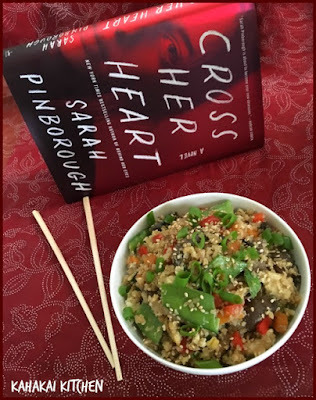 Cross Her Heart is my first Sarah Pinborough book. Well, at least the first one I've read. I chose her bestselling previous novel, Behind Her Eyes as a Book of the Month pick last year, before I decided that my biggest problem with the Book of the Month club was actually reading the books. I have a stack of them just sitting on my shelves. I have a feeling though, that Behind Her Eyes may move up to the top of the pile, now that I have given her a try. Cross Her Heart snuck up on me a bit. I felt like it started a little slow but whether that was me (seriously, I can't read ANYTHING lately at night and stay awake lately) or the book, I'm not sure, but the twists in the story began to unfold and I found myself caught up in this story and the secrets and lies of Lisa, Ava, and several of the other characters. It is easy to assume that you know what Lisa might be hiding herself and her daughter from, and I liked that I had it wrong. I had several things wrong as a matter of fact, until I reached the end. I was expecting a bigger shock than I got--maybe because I heard so much about a shocking twist in Behind Her Eyes (If you read it don't tell me--I have managed to go more than a year knowing there was a twist but not knowing what it is! ), but I felt like in this case, there was a lot of foreshadowing of the big reveal. It didn't spoil the journey for me though, the last third of the book was quite a ride and had me anxiously turning pages. I don't want to say much more than that, as this is a book you'll want to go into without many more details than you already get in the publisher's blurb. If you like mystery-thrillers full of twists, secrets, lies, and family and friendship dramas with interesting and flawed characters, add Cross Her Heart to your fall TBR list--it's engaging and entertaining and will keep you guessing. 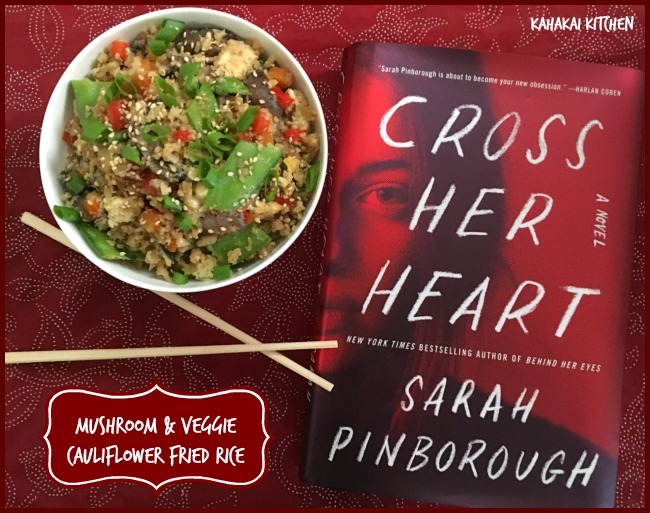 Author Notes: Sunday Times No.1 bestseller Sarah Pinborough is the critically acclaimed and award-winning, adult and YA author. Her previous novel, Behind Her Eyes, has sold in 25 territories, been shortlisted for the Crime and Thriller Book of the Year at the British Book Awards and was a Sunday Times No.1 bestseller in hardback and paperback. 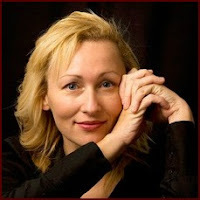 She is also a screenwriter who has written for the BBC and has several original television projects in development. Find out more about Sarah at her website, and connect with her on Twitter and Instagram. Although there wasn't a lot, there was food to be found in Cross Her Heart including pizza, milk, bread, Battenberg cake (an almond-flavored tea cake), tea, Ferrero Rocher chocolates, vodka, cakes, drinks, a punch of fruit juice, lemonade, vodka and Bacardi, a cold jacket potato, donuts, prosecco, sandwiches and chips, microwave popcorn, cider, tequila shot, crisps, brownies, frozen lasagna, oven fries and peas, curry, beer, bread, olives, scallops and sea bream, Chablis, ice cream with wafers, chicken salad, Chinese takeaway (mentioned a few times, from the Peking sweet-and-sour pork and chicken chow mein, etc.) Caramacs, jelly, ice cream, Chocolate cake, beans on toast, and Jelly Babies (a jelly candy). 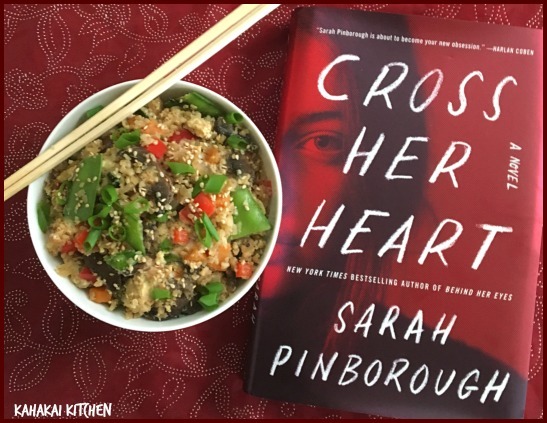 Recipe Inspiration: Since there were several mentions of Chinese take-away, for my book-inspired dish, I thought I pick one of my favorite Chinese takeout dishes--fried rice. 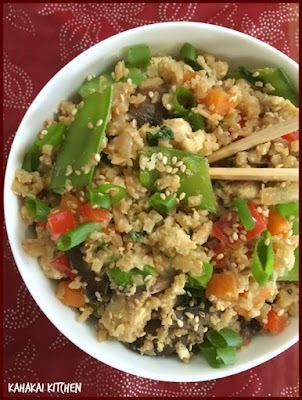 I wanted to be a bit healthier than my favorite take-out place and use plenty of vegetables and since I still had the remains of a large bag of frozen cauliflower rice, use it in place of rice. Prep Cauliflower: If using fresh cauliflower, wash the head and pat it dry, then shred it using the largest holes of a grater or by pulsing the florets in a food processor until it resembles grains of rice. If using frozen, let thaw in a colander then squeeze/press as much of the liquid out as possible. Set aside. 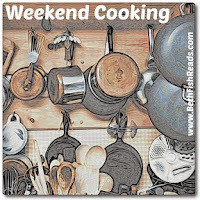 In a large skillet or wok, heat 1 1/2 tablespoons of the oil over medium-high heat. Add the onion slices, carrot, red pepper, the white part of the scallions, garlic and ginger and saute until just the vegetables are just starting to get tender--about 5 to 6 minutes. Stir in the mushrooms and continue to cook until mushrooms are tender and vegetables are tender and cooked through. Remove the vegetables from the pan, cover and set aside. Add the remaining 1 1/2 tablespoons of oil to the pan. When hot, add the cauliflower rice and cook 4 to 5 minutes or until cauliflower is tender but not mushy. Stir in the snow peas, 2/3 of the green onion tops, and the tamari/soy sauce and cook for another minute or two. Then push the cauliflower rice to one side of the pan and scramble the beaten eggs on the opposite side. Once eggs are scrambled, gently stir them into the cauliflower rice, along with the sesame oil. Taste and add additional tamari, salt and black pepper as desired. serve immediately, garnished with the remaining chopped green onion and toasted sesame seeds, Enjoy! Note: This fried rice is at it's best when fresh cooked and hot but you can enjoy leftovers within a day or two. 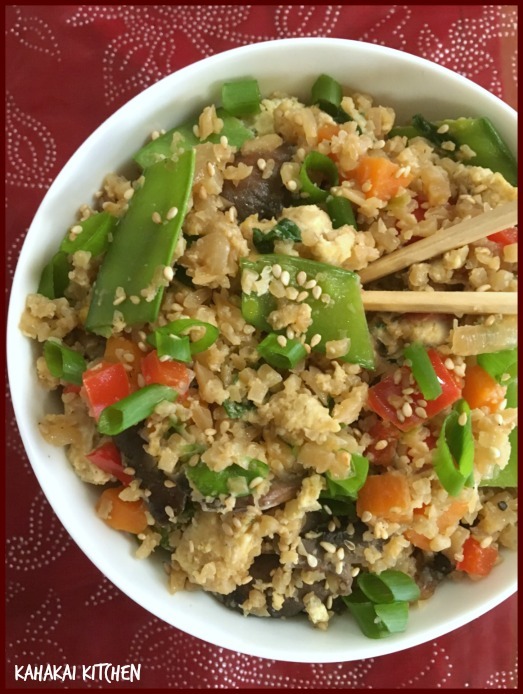 Notes/Results: Especially when served hot and fresh, this cauliflower fried rice stands up to it's counterpart in flavor but is much lighter, less greasy, and so much lower calorie and healthier. If you are using frozen, pre-riced cauliflower, the more liquid you can press from it the better--much like the original, the drier the 'rice'--the better the fried rice as you can get it crispier. Use any veggies you like here, you can also add more protein with shrimp, chicken, or tofu and you can leave out the eggs if you aren't a fan--it's very versatile. I'm not saying I don't love the slightly greasy, salty shrimp fried-rice from my local Chinese restaurant, but a big serving of this works just fine and leaves me some wiggle room for dessert calories. ;-) I'd happily make it again. 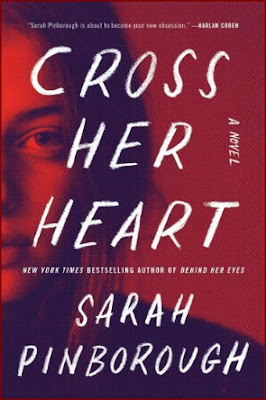 Note: A review copy of "Cross Her Heart" was provided to me by the author and the publisher, Harper Collins, via TLC Book Tours. I was not compensated for this review and as always, my thoughts and opinions are my own. Cauliflower rice is calling to me more and more as you and several others post intriguing recipes for using it in a variety of dishes. Thank you! I made Eric Ripert's lentil soup today. I replaced the carrots with sweet potato, and used a thyme mushroom broth for the Le Puy (French)lentils. Added some red wine vinegar. Your suggestions were very helpful, and the soup is delicious. Thank you. A very good thing to do with a bit of extra cauliflower. I love fried rice and make it quite a lot, using up scraps of left-overs in the process. And, another new author (for me) to give a try. I am a big fan of cauliflower rice. Thanks for an interesting recipe- I usually eat it plain.. I've made cauliflower fried a a few times. Thankful my favorite grocery store sell fresh riced cauliflower. I haven't used frozen yet, but appreciate your tip. We have been talking about trying cauliflower rice. Maybe we will try it in your version. It does look delicious! We tried cauliflower rice last winter and weren't fans, even though we love cauliflower. Maybe I should give it a second chance. So glad these hurricanes fizzled out to tropical storms! Love reading books like these where you can't quit figure them out or they add a twist and prove you wrong. So many times they are too predictable and that's no fun! 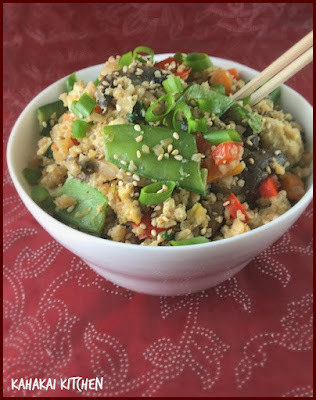 I tried cauliflower rice a few months ago and I really love it. I can imagine adding lots of veggies and eggs would make it even tastier. Definitely a good replacement for the oily Chinese take out we get!